So on the last post about my little Calgary trip, I left you with images of a delicious meal from CHARCUT Roast House. After a long night of sleep with our full bellies, we woke up, checked out of the hotel and found ourselves outside WURST. Seeing that it was Family Day, many restaurants were closed for the long weekend. Some places had taken my reservations on this day, only for me to find out later they had to be cancelled due to the stat holiday. Bah! 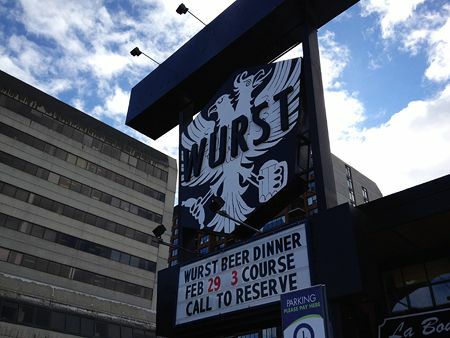 Thank you to WURST for taking our reservations so last minute! The minute I stepped into the restaurant, I had to take a step back and take in the view. 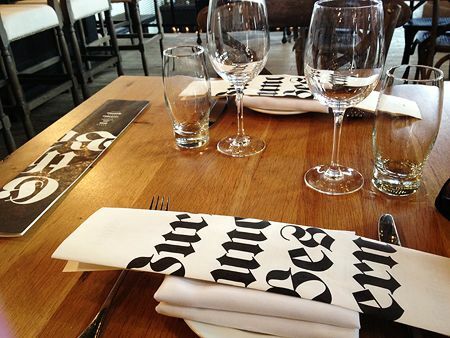 The interior designer that worked for this restaurant is a genius. It's absolutely lovely inside! I tweeted one of the pictures, only to find out that my best friend who is studying interior design is a huge fan of the work! 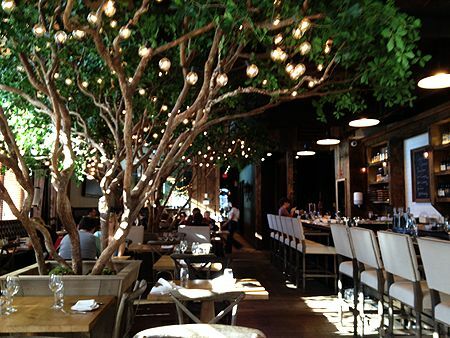 It felt so whimsical to be dining below the trees trimmed with lights.. great environment to be in for an early lunch. We were seated near the bar, in the very spacious dining room. They had a variety of alcohols and beers on tap.. but I wasn't about to start drinking so early in the day ;) All the tables and chairs are crafted out of wood, being simple, but it worked well with the elegance of the trees. I was hoping they might have brunch available, but alas we were given the lunch menu. Gotta come back on a Sunday next time to try out their scrumptious sounding benedicts! We ordered two mains off the menu, hoping they wouldn't be large portions since we were still a little stuffed from dinner the night before. 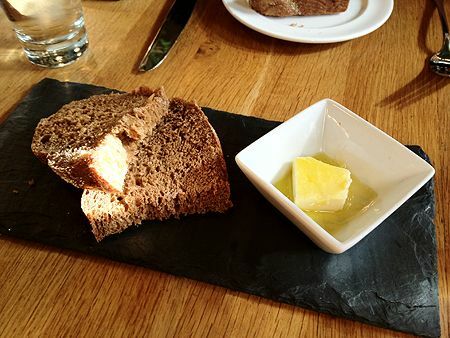 While we waited, our waitress brought along some bread and butter in olive oil to snack on. It was served on a stone plate, which was quite heavy! 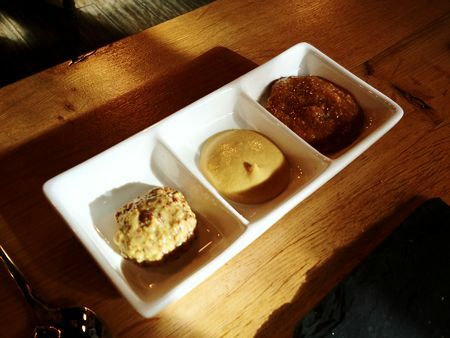 The bread was cold and the butter was hard - wish they could have been presented to us warmed up. Next to arrive at our table was a variety of mustards to go with the entree I ordered, but we happily spread it on our bread since the butter was too hard to work with. One sweet, one spicy, and one smooth - all quite unique, but I enjoyed the spicy one the most - full of seeds and great flavour. Man, I think I'm developing a love for mustard (usually hate it..). 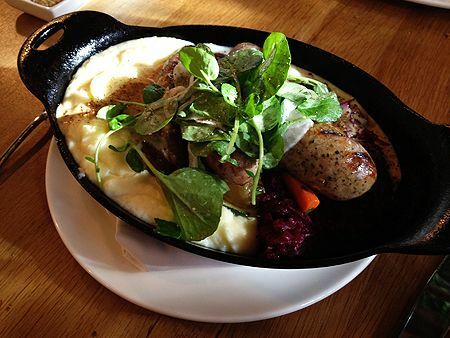 I ordered the pile of bratwurst, served with creamed potatoes, braised red cabbage, and mustard gravy, all served in a cast iron dish. First of all, it was a HUGE portion and I had no idea how to finish it! Second, it was delicious. All the bratwurst is made in house, there were two large sausages, and four smaller ones. The meat was seasoned perfectly, and tasted great paired with the mustards. The creamed potatoes filled about half of the dish, while the other half was filled with the cabbage and some extra vegetables beneath. The taste of the cabbage were reminiscent of sauerkraut - weird for me to be eating it warm, but still good. The taste of it in the dish was a little overwhelming at times when I forgot to eat it with the sausage or potatoes, but it was a nice contrast of flavour. This was the first time Vince ever had "real" German food, so I told him to try out schnitzel. 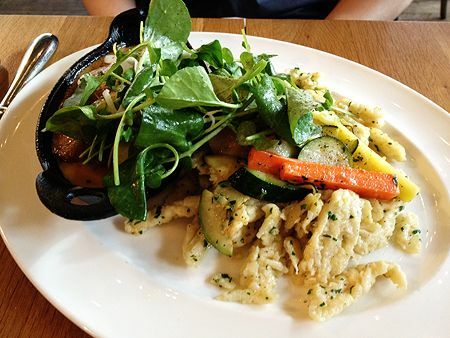 The Jager Schnitzel was served with wild mushrooms, creme fraiche and spatzle, and a couple extra veggies on top. The meat was tender, and the spatzle had bite to it, not too soft and not too hard. The plate was still quite a large portion, but he still finished it all. Both of us were stuffed to the brim, unable to try out any of their other offerings, but I think I'd like to try out their charcuterie items when I come back. I didn't dare to do so since we had a pretty carnivorous meal the night before. All in all, we had a pretty good meal and the service was great. I love the dining atmosphere and will be back! Especially since they now have fondue options... yum. Don't really like german food except Schnitzel! Hey Andrea, Yum, the food looks really good! The only time I had real German food is when we have our annual Christmas German market, don't know much about it, but I do love the bratwurst! Have a great Easter weekend! i've never made it to calgary! but i do like canada in general. Wow I've never tried German food before I don't think... at least nothing that looked at delicious at this! 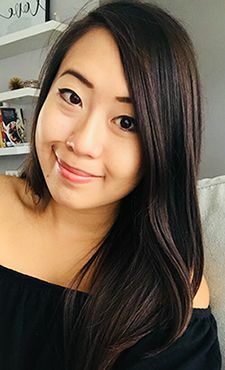 Hope you're having fun! this place looks like my and my bf's kind of place to eat to get a good hearty meal!! we love bratwursts!! and yes you are right about the interior design!! love it! What a gorgeous restaurant and the presentation of the food was perfect. I love the dishes they use. Mmmm, i love bratwurst. Glad it was good.